Get ready for Valentine's Day, or Hearts Day as I like to call it, with this easy embroidered garland of flags. It's the perfect handmade touch for your decor! Each heart can be embroidered with simple stitches, but the large size makes a bold statement. If you want to show off your stitching skills, choose stitches that are a bit more complex. Or, if you're wanting to get in some practice, turn this banner into a sampler! Make each heart with a different new stitch or a combination of stitches. The finished garland measures about six feet long, with flags that are 7 x 9 inches. You can adjust the size by stitching a different number of flags or reducing the size of the pattern and banner pieces. For best results, read through all the instructions before starting. Iron the fusible interfacing onto the back of the linen, following the manufacturer's instructions. This will give the garland flags more structure so they hang nicely and it will prevent fraying. It's easier to leave the linen as one large piece while working. Download the Striped Heart pattern. When printed at 100%, each heart should measure about 5-1/2" across. Trace or print the heart pattern on the water-soluble stabilizer. You will need five hearts. Cut around each heart and attach to the linen, leaving space between each heart for cutting out the flags. Note: You can mark your pattern with other methods if you prefer. The water-soluble stabilizer method is easy, especially when working with linen. Stitch around each heart with back stitch. Embroider the stripes with different stitches of your choosing. For my banner, I stitched two hearts with coral stitch and three hearts with upright cross stitches (they are upright along the diagonal lines, but appear as standard cross stitches when the heart is straight). Any stitches that can be worked along a line would be suitable for this project. You could even have a mix of stitches in each heart. When all of the stitching is complete, soak the embroidery to remove the water-soluble stabilizer. Gently squeeze out any excess water and hang it to dry. Sometimes in the process of working with the fabric as you stitch, as well as from soaking, the interfacing may start to lift from the back of the work. Don't worry! It should adhere once more with a good ironing. Even if the interfacing didn't lift, your embroidery will need to be ironed to smooth everything out. Measure and cut each banner piece to 7 x 9 inches. If you have a quilting ruler, you can line up the indent and point of the heart along the 3-1/2" marking. Mark the top of each embroidered flag for stitching the string through. Measure 3/4" from the top and mark at 1", 3", 4" and 6" across. Cut a 4-yard piece of perle cotton and thread your needle. Slide the needle all the way to the center, doubling the thread. Stitch through each flag, coming up from the back at the first marking, down through the second, and so on. Slide the flag across the doubled perle cotton, and continue adding banner pieces. Space the flags evenly. Tie an overhand knot at each end of the string to use as a loop for hanging. 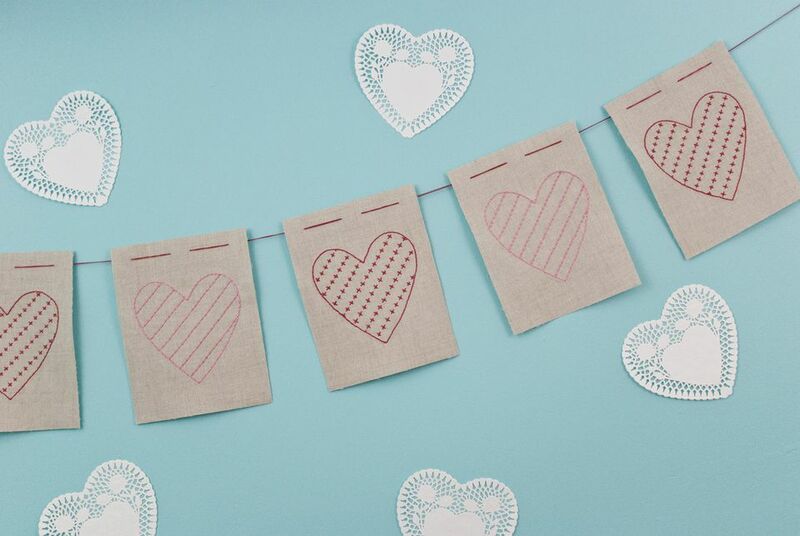 Now you can display your hand-stitched garland and celebrate Valentine's Day!